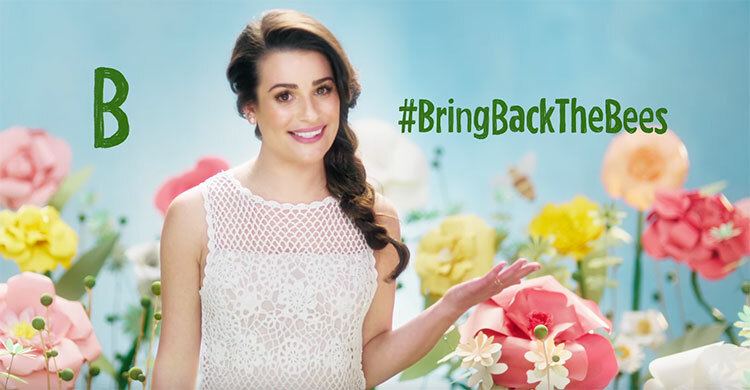 “Glee” star Lea Michele is partnering with Burt’s Bees on a new campaign to raise awareness about the declining honeybee population. The company’s “Bring Back The Bees” campaign at urtsees.com is asking the nation to drop the letter “b” in their social media posts and use the hashtag #BringBackTheBees. Burt’s Bees, owned by Clorox Co., will plant 1,000 wildflowers for each misspelled tweet that uses the hashtag and drops the “b.” If you aren’t an active social media user, you can play your part by purchasing a Burt’s Bees limited edition lip balm. The company is accepting up to 1 million entries, or until June 30, while supplies last. That’s a goal of 1 billion total wildflowers planted. Many other organizations, and the government, are doing their part in promoting honeybee health. In May 2015 a White House task force released its National Strategy to Promote the Health of Honey Bees and Other Pollinators. The plan called for the expansion of bee and monarch habitats and increased research into the effects of disease and pesticides on bees. The task force was created by the Obama administration after studies found winter losses of commercial honeybee colonies have averaged roughly 30 percent, according to the Washington Post. Can’t wait to uy my new lip alm in support of urt’s ees campaign to ring ack the honeyees! #BringBackTheBees ? Burt’s Bees was founded thanks to bees and is using its name and history to make a difference. Burt Shavitz, the company’s co-founder, was a beekeeper, and his bee’s wax was used in the company’s first lip balm, Beeswax Lip Balm. I can’t think of a more simple way to raise awareness on the importance of honeybees to our nation’s environment, including our food security, nutrition and sustainable land. It only took me a moment to tweet, and I also plan to purchase a lip balm. Check out my tweet for an example of how to take part in the campaign. Joelle Harms is Senior Digital Editor for PMP and can be reached at jharms@northcoastmedia.net or 216-706-3780.